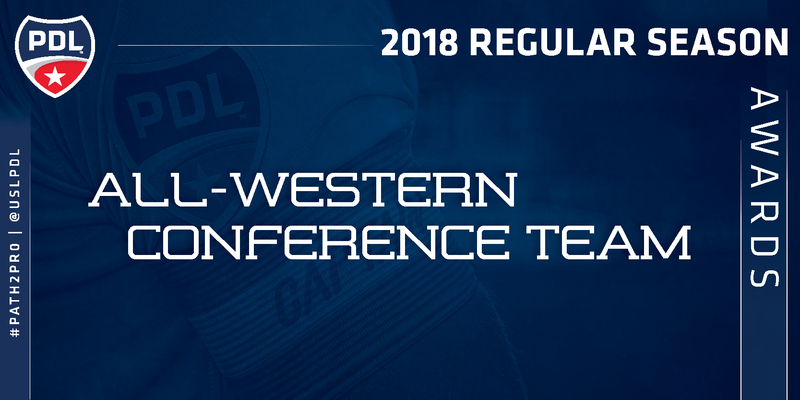 TAMPA, Fla. — Seven teams - Calgary Foothills FC, Victoria Highlanders FC, FC Tucson, Lane United FC, the TSS FC Rovers, Sounders FC U23 and the FC Golden State Force - are represented on the 2018 All-Western Conference Team. The PDL Championship-bound Foothills FC lead this year’s team with five selections represented - including 21-year-old goalkeeper Marco Carducci and leading goal-scorer Moses Danto - while the Northwest Division as a whole comprises eight of the 11 selections. GK - Marco Carducci, Calgary Foothills FC: Appearing in 13 matches (945 minutes) for Foothills FC this season, Carducci was phenomenal in net, allowing just five goals for a 0.48 goals-against average. He also recorded a save percentage of 85.3 and made 29 total stops on the season. D - Callum Montgomery, Victoria Highlanders FC: Montgomery took part in 10 matches for Highlanders FC this season (882 minutes), scoring two goals while helping the defense to two clean sheets. The No. 19 prospect league-wide returns for his senior season at Charlotte this fall. D - Dominick Zator, Calgary Foothills FC: Zator competed in all 14 matches (912 minutes) for Foothills FC this campaign, recording one assist on the season. Combined with Carducci, Zator took part in eight clean sheets in 2018. D - Henry Lander, FC Tucson: Appearing in 13 matches (1,012 minutes) for FC Tucson this season, Lander’s work in defense led the club to three clean sheets this year and a playoff appearance. The rising senior and AFC Bournemouth Academy product returns to the University of San Diego this fall. M - Nico Pasquotti, Calgary Foothills FC: In 13 appearances (937 minutes), Pasquotti was second on the team in assists with seven, and also contributed three goals. He contributed at least one goal or assist in eight matches this season. M - Elijah Adekugbe, Calgary Foothills FC: A dominant force as a holding midfielder, Adekugbe appeared in all 14 matches for Foothills FC this season (1,203 minutes), and went the full 90 minutes 13 times. While he didn’t record a goal or assist this year, his defensive work was key in eight clean sheets. M - Willy Spurr, Lane United FC: The team-leader in goals with seven, Spurr appeared in all 14 matches for Lane United FC, missing only 15 minutes all season (1,245 minutes) while proving crucial in midfield. He also tallied one assist on the season. M - Matteo Polisi, TSS FC Rovers: Appearing in all 14 matches for the Rovers (1,056 minutes), Polisi led the team in assists with five and also recorded two goals. The No. 37 prospect league-wide will return to Simon Fraser University this fall for his sophomore campaign. F - Moses Danto, Calgary Foothills FC: Appearing in 10 matches (787 minutes) for Foothills FC, Danto led the team in goals with 11, and racked up two assists as well. The No. 50 prospect league-wide had a standout match on June 17 against the TSS FC Rovers saw him record four goals and one assist while being named PDL Player of the Week. F - Santiago Patino, Sounders FC U23: Patino appeared in all 14 matches for Sounders FC U23 (1,020 minutes) and had an incredibly productive season. The forward led the team in both goals, with nine, and assists, with three. Patino returns to FIU this fall for his senior season. F - Samuel Villava, FC Golden State Force: Appearing in 10 matches (765 minutes) for the Force in their 12-1-1 campaign, Villava was the team’s top goal-scorer, tallying 11 goals this season while adding two assists. His nose for goal helped the team find the back of the net a total of 38 times, best in the Southwest Division.